Bois d'Arménie is a popular perfume by Guerlain for women and men and was released in 2006. The scent is woody-spicy. It is still in production. Bois d'Arménie is part of the collection "L'Art et la Matière". It is rare to do anything wrong if you bet on the Guerlain horse, and the "Bois" series contains many a beautiful work that can be called simply aesthetic. The "Armenian wood" is again one of those charismatic autumn/winter scents that go towards a slightly firmer embrace. In the beginning a little bit brash in the combination incense/coriander/guaiac wood, gradually a very creamy outlined basic tone of elegant woody character unfolds, which almost steps along a little powdered, solemn, if not even festive, and to which one could most likely still accuse it of lacking some suitability for everyday use. The Brazilian Kopaivabalsam may be to blame for this, which according to various sources is described as very "special" (bitter) and which here certainly provides a quite idiosyncratic undertone, which could be described as somewhat penetratingly bitter. Without question, Guerlain has integrated the whole thing well in the overall view, but this time it can't convince me to 100%. Interesting made, without me this time but to be able to capture in full. On this way again many thanks to all for the New Year's wishes. I was very happy about that. Now let's get in the car. A new year, new test, new commi. What haven't we heard already tonight. There were the American representatives Backstreet Bois with their hit "Quit playing games with my Perfum", who made the hearts melt. Later Ireland and Boisone sent their representatives on stage with the song "When the Sprüher gets Tough" and the audience lay at your feet. Bois George in the jury was moved to tears when Bois II Men performed "End of the Flakon" and the hall became a sea of lights. Afterwards the band needed a boiscout to get past the screaming fans. The Cure brought their hit Bois don't Cry to the best in the break, followed by Don Henley with Bois of Summer. Now we wait for the Armenian representatives Bois d'Arménie who are next and we can only tell you that the stage is ready. The lights go out and the show starts. The audience is excited, it is quiet as a mouse in the hall, the first notes of the two singers Iris and Rosa Pfeffer ring out and a pyro explosion catapults the third act of incense onto the stage. What a show. Powder trickles from the ceiling as background and the first sparklers are lit. The hall already seems to be a single embrace as vanilla and wood enter the stage and join in the singing. The two main singers also sing the chorus and it doesn't get balladian, no it gets completely balsamic right away. Beautiful and clear as a bell, the two sing in duet accompanied by the first 3 representatives, who, however, take a back seat. The band is completed with the two dancers Moschus and Patchouli, who devotionally express the song. What a performance. The audience is now one bright star as the song ends much too early, but it still echoes for a while. Vanilla, whose middle-class name is Benzoe, once again impressed with his performance and it was once again evident that producer Guerlain had his fingers in the pie here. It was unmistakable to hear his style and as we know, he inspires the masses with it. Quite right! The clou to let him sing the chorus together with wood was completely open and the multi-faceted singing of coriander gave the whole thing a certain spice. The people in the hall are enthusiastic and demand an encore that you can treat yourself to at any time. With that we are already at the end of our Kuschelrock contest and fittingly we saw the highlight at the end of this show. We see more girls screaming, but also some boys celebrating this performance. In autumn/winter Bois d'Arménie go on tour, you can have a look at that. Even though we didn't understand what the song was about, it was an experience. I guess it was Boisme. We are still cuddly and say goodbye very quietly and thank you and the director Skylla, who made the broadcast possible. Since I lived in France for a few years, I also met the paper d'Arménie, bought it and used it. Fold a strip of paper from the booklet, place it on a fireproof base and light it. Then you let the paper die and it spreads a heavenly smell. Great stuff and pretty cheap. At the end of the 19th century, a French chemist travelled through Armenia and noticed there that the population had benzoic resin die away in their houses. This was done not only because it smelled good, but also because the benzoin had a disinfectant effect. On his return to France, the chemist Auguste Ponsot produced blotting paper strips soaked in benzoin distilled in ethanol and salt water. He founded the historical factory in 1885 and it is probably still in use. He first presented these strips of paper to an international audience at the World Exhibition in Paris in 1889. Everyone knows the Eiffel Tower, but today Papier d'Arménie is only known in France, I would bet. The paper is used today for room scenting. It smells like benzoin and vanilla. There's also a new strain I haven't tried yet. It was created in 2006 by Francis Kurkdjian on the occasion of the 15th anniversary of the independence of the Republic of Armenia. In 2006, the fragrance "Bois d'Arménie" was launched on the market and this is no coincidence. Enough smart handwriting. How does it smell now, the perfume? It smells exactly like the paper d'Arménie (even if family tester M claims it smells like olive liquor). Don't listen to M, it immediately smells of incense and benzoin and then becomes vanilla in the process. Warm, smoky, resinous and cozy. Totally authentic. I'm ravished. The focus is on the wood. Gayak or gujak wood. Balsamic. Resinous. Dark grained. Fine herb-dark fragrant. Star of the day or evening or whenever. But to be honest, if I were such a wood (purely imaginary of course), I wouldn't want to do without friends who stand by my side. But not the next best one would be a good choice. I would need someone "powdered", smelling of iris, which makes me a little "softer". And someone who has an incense pomander with him to underline my mysterious aura. Well, there's three of us already. But to have really much fun, there is still something missing at "spice of the life" someone exotic, which does not exaggerate it however. I just remembered Mr. Koreander, who always puts on such a fragrance that tickles his nose a little. I'll take that with me. A little something is still missing to find my true center. Yes, but of course. I'm glad, it occurred to me: Mrs. Benzoe, I believe from Siam. But not catty. More like something in between. Fits. MMMMH, wait a minute. For my "dark side" I also need a supporter. I rarely go to cemeteries or dark cellars, but such a small thrill must be. Only the old buddy, Senior Patchouli, can do that. He has been a faithful companion in other combinations. From MIR... Who likes to be the centre of attention himself... but we've been over this. I know, my ego. But Patchouli is already very good for me. To be complete, I still need someone to highlight my mild, soft side. Some kind of sorceress, that is. Whenever I look a little too grim, she makes me aware of it with "siren-like whispering" and puts her fine veil over my face. The Unique the Loving...".Russian" Madame Kopaiva, the "Balsamic", from Odessa, the city between the cultures. All will be invited, all together we will score with the "audience". "Don't be so demanding." there's a voice murmuring beside me, It's Mr. Koreander. When I first met "Bois d'Arménie", I spontaneously thought of "The Fog of Avalon"! I cannot explain this first intuition and I am sure some people will say here: "Yes, is it so stupid that it cannot distinguish between Britain and Armenia? I can, but nothing changes: "Avalon" stays in my head! More the title that creates a little creepy silhouettes of fog of waffled trees in front of my inner eye than the content. "Bois d'Arménie" brings with it the first impression of late summer, a cleverly packaged finiteness. Just yesterday Meggi, Can777 and I talked about the fact that this season with its special charm is slowly coming. A slightly woody-spicy note develops very quickly with me after the first spraying. The individual scent components do not appear here as solitaires, they unfold immediately as a unit and almost in perfection. That with me cold-blooded being some smell development takes another course, is in the meantime known. So the balsamic wood greets us, whether it really was at home in Armenia or not, together with a fine dose of pink pepper; even the iris - which I always feel to be slightly earthy and musty - is there: a trio emerges that is already pleasantly surprising and touching. Here the iris fits wonderfully. It places small light spots in the woody aromatic, a little cloudy. The resinous nuances of benzoin - always with a certain autumnal touch - and frankincense refine the previous fragrance composition. Already now I feel a certain sacral impression: it is as if I am surrounded by an autumnal, herb-scented mixed forest. That's why incense fits so well into this forest cathedral: it brings something mystical with it. Coriander adds a green spicy note; I now think I perceive a hint of turpentine. Well, not rare on walks in the woods. But what makes turpentine in a fragrance? The research on the corresponding internet pages shows that the copaiba balsam mentioned in the fragrance pyramid is viscous and terpentine-like fragrant. I don't know which of the many varieties came here. It's also not necessary to know that: this fragrance process adapts harmoniously to my currently somewhat melancholic mood. Patchouli and white musk float around "Bois d'Arménie" like light fog, gently floating through the morning forest solitude. On their way through this woody-spicy beauty of scent, they certainly also encounter the forest nymph Melancholy! She accompanies me from the first moment of our closer acquaintance. And makes me think of Vincenzo Bellini's "Malinconia, ninfa gentile." "Bois d'Armédie" doesn't make me sad; it makes me a little wistful and quietly reminds me of the "circle of the year". And thus to the fact that also such an extreme summer like this glides so slowly into a late stage and thus into a soft, well-scented autumn and we accompany it thereby. The abundance of the usual Guerlain-Sillage and a nice shelf life help; they let some nymphs dance in the woods felt. On a day in August that promises another maximum temperature of 30°, perhaps a late summer scent commentary with "fog formation" does not seem quite appropriate. And yet I'm not the only one who feels a slight longing for autumn, with its fog games and their quiet secrets. The year is tilting quietly and when the first forest nymphs are dancing again, we should keep our eyes open: "Bois d'Armédie" helps! And Yatagan's photos, which I owe this scent sample to, impressively show the thoughts that go straight through my head. This scent promotes my well-being in a peculiar way, makes me a little thoughtful, a little dreamy: it shows "panta rhei" in a special way! It is worth taking a lot of time to discover slowness! There is a certain kind of paper – the sort which you may use to cover the shelves in a cupboard – that allegedly was responsible for the creation of Bois d'Arménie: a childhood memory of Sylvaine Delacourte – as I read or heard somewhere. As Guerlain's art director, she seems to have a leading influence on the creation of new fragrances. Well, another of those Guerlain legends! With Bois d'Arménie, Guerlain gives us a fragrance which simply can only come from this house. It is this special handling of vanillic notes, which only Guerlain has lead to perfection. For me, it does not matter that vanilla is not mentioned as such in the known fragrance notes. Anyway, Guerlain is always telling only half of the truth. The vanilla – or whatever I identify as such – has an unbelievable depth and intensity. It is not accompanied by woody tartness as the tonka complex in Arsène Lupin Voyou, but by a completely different dark and recondite woodiness. This has some resemblance to certain liqueurs, but without being overly sweet. And also, it almost has some smokiness. In its clear, only slightly shaded expression, this vanilla comes near to the wonderful Spiritueuse Double Vanille, however, it is darker. With that paper story, Bois d'Arménie touches the world of orris fragrances – besides the powder note there is the impression of old foxy paper which also applies to some orris fragrances, and among those most of all to Dior Homme. They have something in common, however, only initially. Bois d'Arménie is not developing any “lipstick” accord as the Dior scent does. Bois d'Arménie is a difficult fragrance, and it is a little bit demanding. The pithiness of the vanillic part obviously makes it necessary to shift down the intensity. And so, Bois d'Arménie is a difficult candidate for testing. During my first encounters at my local Maison Guerlain, Bois d'Arménie seemed to have nothing to say. Having my olfactory sense affected by other, less discreet fragrances, I was hardly able to smell it. Bois d'Arménie creates only a faint aura around its wearer – getting acquainted with it needs some time and devotion. Besides vanilla and orris, no other note reveals itself to me. On the contrary, during its development Bois d'Arménie more and more retreats into the vanilla-like shell until it is completely faded after almost a day. So, which one is to prefer? The clear and ethereal Spiritueuse Double Vanille, or the noble, darkish Bois d'Arménie? Of course, these questions are not to be answered. Both will equally delight their owners – providing that one can cope with such a lot of vanilla-like orientalism. Personally, I only sometimes like to wear it – carefully, so to say. Please consider: a vanilla ice cream is consumed within a few minutes – but Bois d'Arménie will last many hours! Despite its discreetness, one better wears this beautiful fragrance with consideration. Eat it like a titbit! I am yet another female jumping on the band-wagon for Bois d'Armenie. Screw the 'for men only', I will happily douse myself in this and call myself a lady. It's such a compelling and beautiful fragrance, something that should be shared between the genders. This is everything I pretty much love in perfume; woods, incense, dustiness, spice and heaviness. Although vanilla is not listed as a note, it is most certainly there, particularly in the drydown. I may just describe this fragrance as creamy vanillic incense with faint, white woods. The pink pepper and the patchouli often like to provide an extra tang to this fragrance, however the sharpness of these notes comes and goes. Another favourite of mine from this exclusive Guerlain range is Rose Barbare, which I loved more for its complexity rather than the scent itself. The same could be said of Bois d'Armenie. If I ever tire of this fragrance (be damned if I do! ), it will be Annick Menardo's exquisite work that will keep me interested. Most resinous notes tend to be masculine and sometimes fierce, however the resinous drydown of Bois d'Armenie is actually sweet. The sweetness was a shock to my senses, however the more I smelt it on my skin, the more addictive and perfect it seemed. 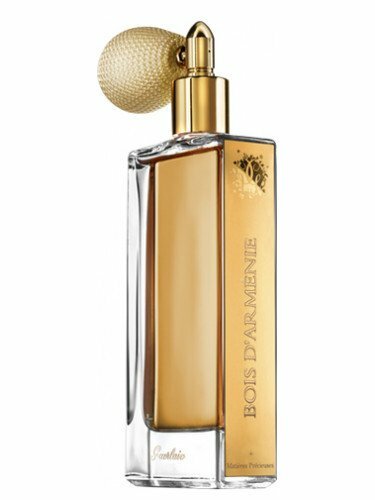 Bois d'Armenie is elegant, like something I would wear to an upper-class formal event. The lasting power and sillage are of course a reflection of why this fragrance is priced so high. It is unfortunate that in my current financial predicament it will be a few years before I see a bottle of this. I guess it will be an incentive to try harder at University to score that high paying job which will fuel my adoration for expensive perfumes. I am not sure what accounts for the slight sourness in the opening of Guerlain BOIS D'ARMENIE, but it quickly dissipates, leaving an ever-so-lightly spiced woody vanilla fragrance which compares favorably to Dior DOLCE VITA and is at least unisex, if not better suited for women than for men (as advertised...). However, at five times the price, and with mediocre staying power, BOIS D'ARMENIE, while certainly nice, will not be sitting next to my shimmering bottle of (unreformulated) DOLCE VITA anytime soon. To be honest, I prefer the Dior composition. Just lucky, I guess! I gave up on Guerlain after the release of Spiritueuse Double Vanille, which I still love.